This is perhaps the most important amongst the support and resistance levels. These levels can be found by zooming out to a longer time frame, typically the weekly or monthly charts. What we want to achieve is to identify the obvious levels at which prices either reversed higher or lower and draw horizontal lines at them. These levels may not be exact, some may intersect with each other. This can be considered as the first step with regards to support and resistance levels and it is the first thing to do when analyzing the chart. The next thing to do is to zoom down a time frame to the daily chart, in order to “fine tune” our levels some more. The primary time frame for finding trade setup is the daily chart. As such, it is important that we understand the much broader picture on the weekly charts but also that we can identify the shorter-term levels on daily basis. One thing to keep at the back of your mind is to that, you should always leave the higher time frame levels on your chart when zooming into the daily, or even the four hours or one hour. Stepping swing point levels in trends. Have you ever heard anyone ever say before, “old resistance becomes new support and old support becomes new resistance? This statement refers to the phenomenon of a market making higher highs and higher lows or lower highs and lower lows in an upward or downward trend. It is necessary to mark these levels as they form, then in case the market breaks down or up through them, we can look to trade on pullbacks. This gives us an opportunity to map the trends in the market. These levels presents very good points of entry in the market as well as points to define risk or stop-loss points. You can place your stop-loss order on either side of these levels. Dynamic means moving levels or moving averages. 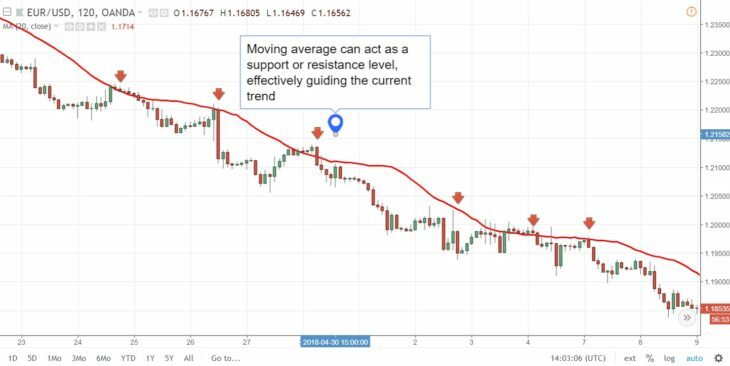 Moving average moves up or down in accordance with price movement and it is possible to set it to consider a certain number of bars of time period. 21 and 50 EMA or exponential moving averages are my personal favorite. I prefer to use them mostly on the daily chart time frame but they can also be used on the weekly charts as well. Exponential moving averages are useful for identifying the market trends and for joining that trend. We are able to watch for the price to test the moving average after breaking either above or below it, and then look to enter the market at or close to that moving average. Below is an example demonstrating how 50 EMA can be used to identify a downtrend as well as to find entry points within it. Ideally, we will expect to look for a one hour, four hour or daily chart price action sell signal as price gets closer or hits that level on a retrace back up to it in a downward trend like this. As demonstrated below, the twenty-one exponential moving average can be used in a similar manner as we can see below. Ego, the twenty-one exponential moving average may be the preferred option than the fifty in a less volatile market. Despite the fact that I do not use the traditional Fibonacci retracements and their numerous extension levels, there is a proven phenomenon that after a period of time, markets usually hold the halfway point of a swing, whilst market makes big moves, retraces and then bounces in original direction. This is partly a self-fulfilling event and partly just an outcome of normal market dynamics. Looking at the chart picture above you can see Fibonacci Retracement levels applied on a downtrend leg. Note that the market has retraced several times after successfully testing 50% Fibonacci Retracement level. Trading on Range and Resistance Levels. This support and resistance strategy is one of the most imortant ones. 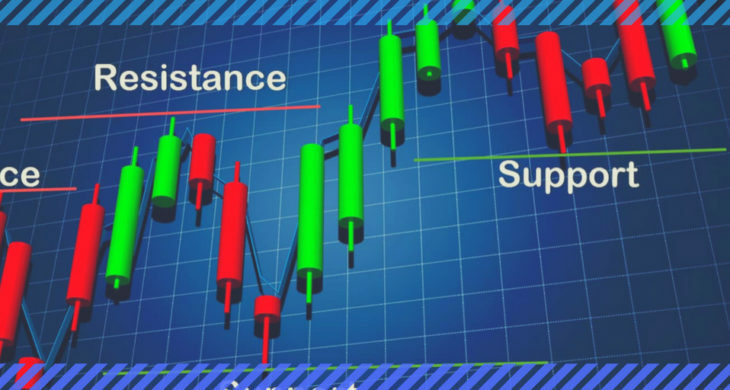 Trading based on range and resistance levels can provide you with numerous high-probability entry opportunities. The principal idea is to first identify a trading range and then look for signals of price movement at those levels or look to fade the level on a blind entry. What I mean by fade the level is that if the market is moving up and at the main resistance of the range, look trade the opposite way or look to buy the support of the range. It is possible to do this until price clearly breaks and closes on the outside of the range. Event area support and resistance. This is the final type of forex support and resistance level that we will discuss in today’s article. Event areas are considered as proprietary form of support and resistance. Event areas are the main levels in the market where events of major price movement occurred. A typical example is a big reversal or clear price action signal, either of which led to a strong directional move. In the example illustrated by the chart below, you can bear witness clearly to event that was formed after bearish reversal bar on the weekly chart. As price action got closer to that level on a retrace some months later, we would have preferred to be certain to have that level on our charts as it was a strong level to look to sell at either on a blind entry on a one hour, four hour or daily chart sell signal. I hope that this article has shared some light on the major types of support and resistance and some of their uses which include indicators of market condition, levels to look to buy or sell from, levels to define risk and as a framework to understand what the market has done, what it is currently doing, and what it might do in the future. A combination of solid understanding of support and resistance levels, price movement, and the trends in the market will give you an edge in the financial market.